“Oh, you can’t help that," said the Cat: “we’re all mad here. I’m mad. You’re mad." “How do you know I’m mad?" 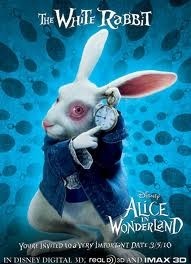 said Alice. “You must be," said the Cat, “or you wouldn’t have come here." Alice laughed. “There’s no use trying," she said: “one can’t believe impossible things." “I dare say you haven’t had much practice," said the Queen. “When I was your age, I always did it for half-an-hour a day. Why, sometimes I’ve believed as many as six impossible things before breakfast."